Originally published under the title "Steven Salaita: BDS's Favorite Martyr." Former Virginia Tech professor Steven Salaita tweeted last year that Israel's alleged excesses make anti-Semitism "something honorable." 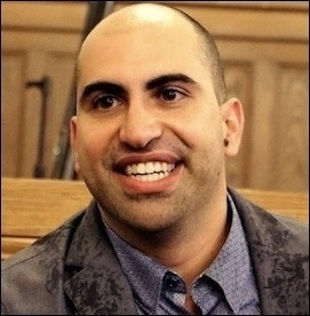 Salaita claims the "Zionist lobby" targeted him for his "scholarly" and "objective" views. 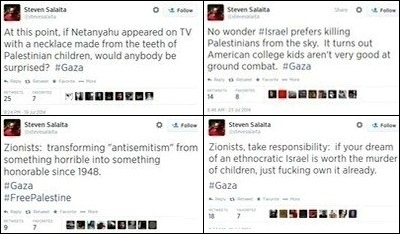 Some of the tweets that cost Salaita a position at the University of Illinois at Urbana-Champaign. Moreover, he asserted that "academic Freedom never fulfilled its inherent promise" because it doesn't allow for individuals like himself to express their views. Institutions pressured by Zionists are criminalizing his views, which he claims—against all evidence—are "scholarly" and "objective." Anti-Zionism has dominated the field of Middle East studies for years. Salaita's meteoric rise as a left-wing cause célèbre rests precisely on his vitriolic views, grounded as they are in anti-Semitic conspiracy mongering rather than rigorous, objective scholarship. No one has a "right" to tenure, nor to freedom from the consequences of his behavior. When professors who substitute agitprop and rank propaganda for scholarship are seen for the charlatans they are rather than the principled victims they pretend to be, academe can start down the long road to reclaiming its integrity.